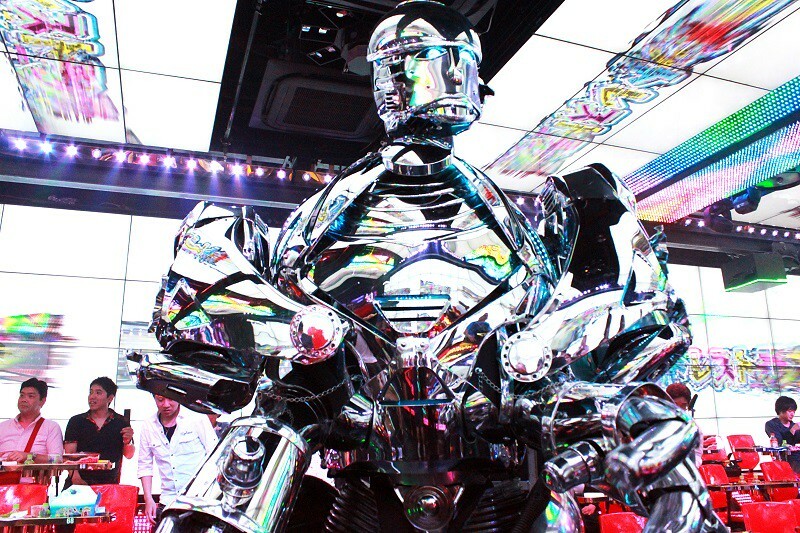 JAPANTWO Blog » Blog Archive » Robot Restaurant: It’s Mecha Fun | Tokyo,Japan guide to Travel, Living, Food, Culture, Anime, Manga and Things to Do. Anyone looking for the Robot Restaurant in Kabukicho won’t be able to miss it. Even amongst the brash neon signs of Sakura-dori, it stands out with its blindingly sparkly signs proclaiming ROBOT RESTAURANT. Or you could just look for the dinosaur in front of the restaurant. Contrary to its name, the Robot Restaurant is not a place where robots serve you food. It’s actually more like a theatre, where you watch performances of girls and robots (but mostly girls) while having a meal. The robots are quite cool, but really quite incidental. 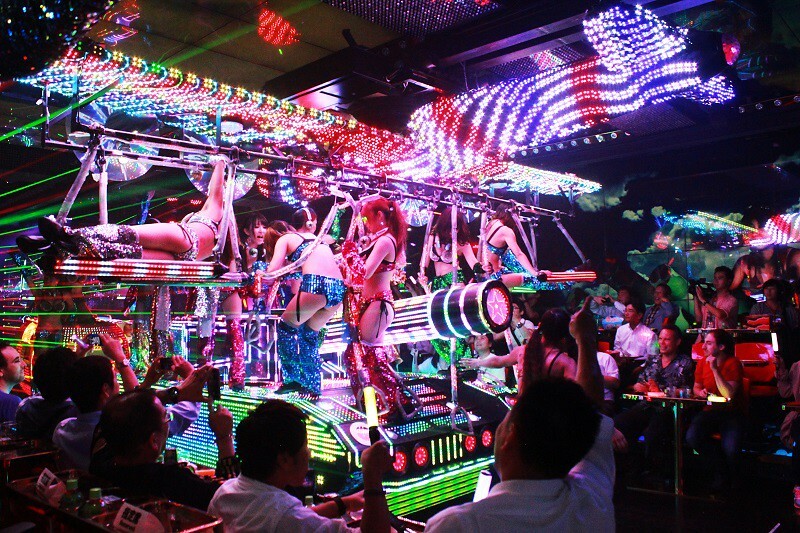 Everything about the Robot Restaurant screams Cool Japan – it’s every single stereotype the West has about Japan concentrated into one underground basement in the space of 70 minutes. 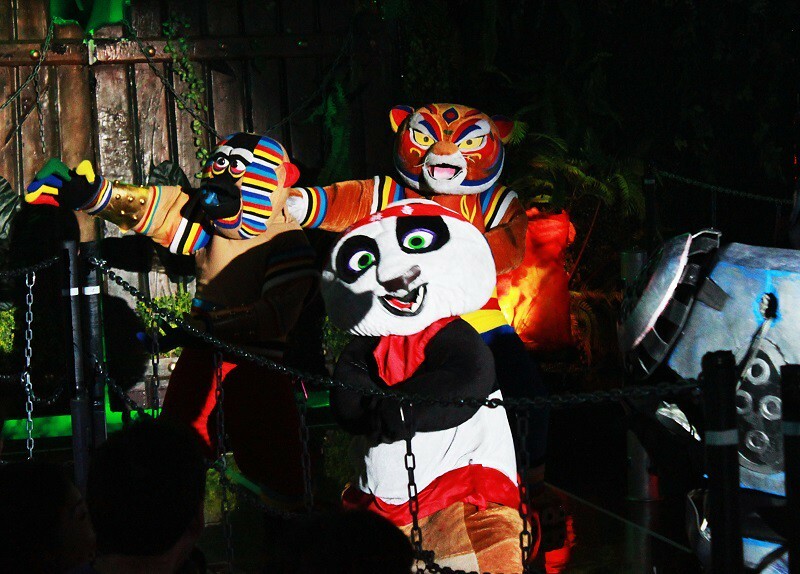 Waitresses in cat ears, giant robots, gorgeous, scantily clad dancers wielding katanas and banging taiko drums, even backstage staff who look like ninja – all these and more can be found here. It revels in being over-the-top. To their credit, the constantly rotating cast of dancers seems to be quite versatile – besides dancing with blades and fans, they also play the taiko drums, they even manage to toot a few notes on trumpets while dolled up as a marching band. So what is this performance about, anyway? That’s a little tricky. Truthfully speaking, the plot is thinner than the finest washi paper, but with a panda battling it out against dinosaur robots, who cares about a storyline? It’s 70 minutes of pure entertainment where they’ve thrown in all the ridiculous things they could think of. Cute girl in a tiny skirt with a giant hammer? Sure. Sudden time-skip to prehistoric eras where the primitive tribe defeats the advanced robot civilization? Absolutely! Robot disco with Harlem Shake and Gangnam Style, with star-spangled girls revolving around you? We’ve got you covered. You’ll even get a neon light stick to shake along with the music. Is it worth going? Sure – if you’re into Cool Japan, this is not something to miss. 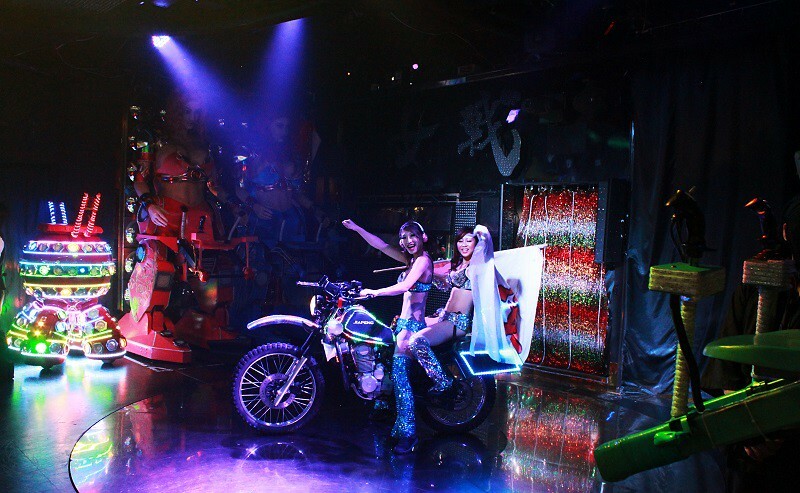 Besides, if the robot restaurant was good enough for the likes of Kyary Pamyu Pamyu and Baz Luhrmann (who was there the night we popped in for a performance), it’s certainly good enough for you. For 5000 yen – which includes a performance, dinner, being able to use a golden toilet (seriously) and opportunities to take photographs with the robots – it’s a pretty sweet deal. Incidentally, they also have a package where they include a tour of the surrounding area of Shinjuku, i.e. Kabuki-cho. This is your chance to ask them about all the interesting and shady sides of the most famous red-light district in Tokyo (though whether they’ll answer those questions is really quite another matter altogether). With only 100 seats in the theatre, every performance is usually booked solid, so we highly recommend reservations well in advance.